Scarlett Johansson, Jennifer Lawrence and Emma Stone. Emma Stone, Jennifer Lawrence and Scarlett Johansson aren't nymphets anymore, but according to Kyle Buchanan's New York magazine Vulture post "Emma Stone, Jennifer Lawrence, and Scarlett Johansson Have an Older-Man Problem". 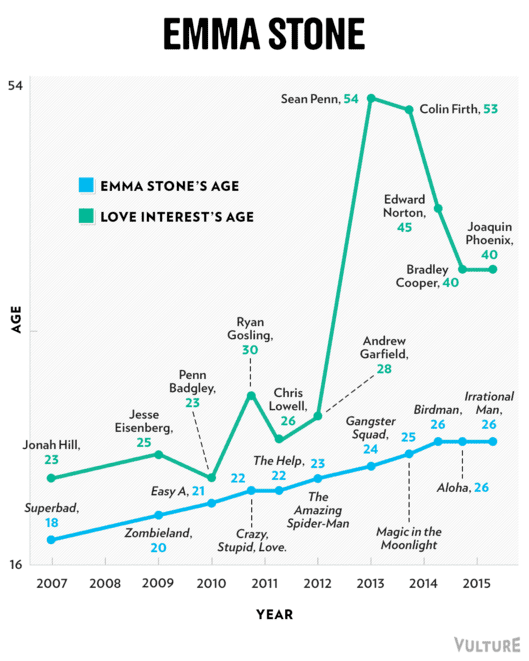 Here's an excerpt and some graphics: Emma Stone is a mere 26 years old, but in the last cinematic year, she's had four onscreen love-interests who were over 40, including two male characters who were impotent. 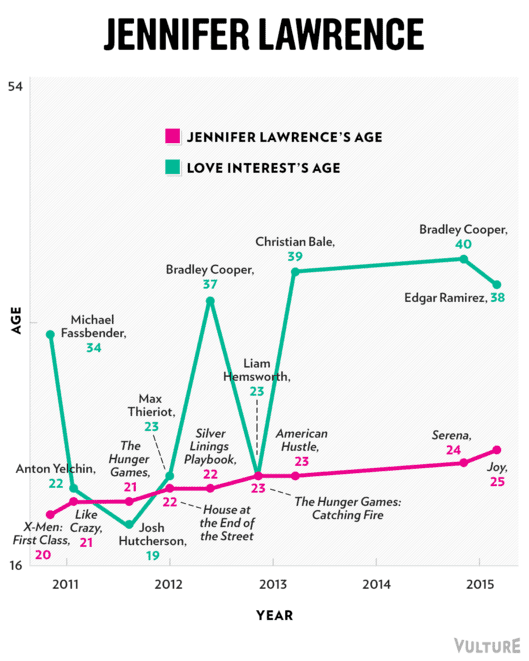 Jennifer Lawrence is Hollywood's most in-demand young actress, but ever since she won her Oscar, it's hard for her to find a screen lover who isn't approaching middle age. And Scarlett Johansson has been paired with older actors so often that when she romanced Mark Ruffalo in this summer's Avengers: Age of Ultron, their 17-year age difference was the least nitpicked aspect of their union. Even post-nymphets are alluring to Hollywood - especially when they're paired with older men. Thanks for your interest. New posts are coming ASAP. I'm consumed with working on the 2nd edition of the book. Thanks again!